The formation of religious beliefs is fundamental to Catholic education. Although Catholic-Christian faith and values are integrated throughout the entire curriculum and school day, Saint Patrick students also engage in religious education classes. Understanding the story of salvation as presented in Scripture is essential for students to grasp God's personal love for them, as well as their Christian responsibility for loving and serving their neighbor. 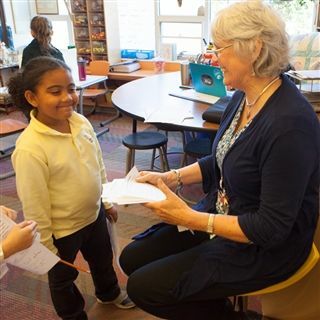 Religion classes reflect the Roman Catholic faith and are based on a curriculum established by the Diocese of Richmond; all religion teachers at Saint Patrick are certified by the Diocese of Richmond. Precepts in religious education are also taught weekly in Mass and chapels. Saint Patrick respects parents as their children's primary educators, whether Catholic or friends from other faith traditions, and encourages families to teach their children about their personal theological and religious beliefs. When home and school collaborate effectively to communicate character-forming ideals, children learn the virtues of tolerance, forgiveness, patience, love, and compassion. Sacramental Preparation: Parents of Catholic students are reminded that sacramental preparation is facilitated through your parish. This is a Diocesan policy and request of the Bishop. Your child should enroll in classes offered by your parish to participate in the preparation. It is best to contact your pastor in the fall for information regarding times and dates for the year's sacramental program offerings. In order to support the family's efforts in preparing for these sacraments, formal instruction is given in grade 2 to all of our Catholic students. This instruction is not intended to take place of the programs that individual parishes have in place.